Why the background tiles when full screen to view page turning book? Why the background tiles when full screen to view my page turning book? Q: Hello! I had faced a problem When I converted my PDF to page turning book with Page Turning for PDF. I selected a Float style template and choose my own picture as background picture, it seem normal when I preview the page turning book, but after it was converted, I found the background repeated (or tiled) when full screen to watch. Could you please tell me why? A: We have take your problem into consideration and finally find out what is wrong with this situation. When choosing Float template to design page turning book, sometimes because the background picture's resolution does not match the screen resolution, for fitting to screen, the background picture will repeats or tiles. That is why your page turning book seems not normal. Step 1: Launch Page Turning for PDF and import PDF document need to be converted. 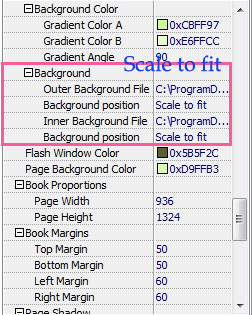 Step 2: In design settings dialog, find out "Background" option and select "Background position" as "scale to fit" from the drop-down box. Step 3: Choose "Apply Change" to confirm change.